A thermistor sensor is a temperature-sensing element composed of sintered semiconductor material which exhibits a large change in resistance proportional to a small change in temperature. Thermistors usually have negative temperature coefficients which means the resistance of the thermistor decreases as the temperature increases. Thermistors are made using a mixture of metals and metal oxide materials. Once mixed, the materials are formed and fired into the required shape. The thermistors can then be used “as-is” as disk-style thermistors. 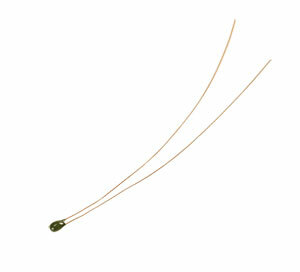 or further shaped and assembled with lead wires and coatings to form bead-style thermistors. Thermistors are typically supplied with very small diameter (#32AW or 0.008" diameter) solid copper or copper alloy wires. Many times, these wires are tinned for easy soldering. Many manufactures list a Beta (B) constant between 2 temperatures (Example: [3 0/50 = 3890). This, along with the resistance at 25°C (77°F) can be used to identity a specific thermistor curve. See pages this webpage for Omega’s thermistor curves. The thermistor element is the simplest form of thermistor. Because of their compact size, these elements are commonly used when space is very limited. OMEGA offers a wide variety of thermistor elements which vary not only in form factor but also in their resistance versus temperature characteristics. Since thermistors are non-linear, the instrument used to read the temperature must linearize the reading. The standalone element is relatively fragile and can not be placed in a rugged environment. 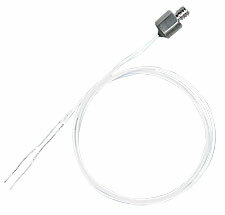 OMEGA offers thermistor probes which are thermistor elements embedded in metal tubes. There temperature probes are much more suitable for industrial environments than thermistor elements. Finished thermistors elements are chemically stable and not significantly affected by aging. Thermistor beads are generally not designed for direct immersion into a process. They are small devices that change temperature very quickly since the only thing between them and the environment is a thin coating of epoxy. At Omega, offer a comprehensive line of sensors that protect the thermistor while allowing it to be used in a wide variety of applications. Below are a sampling of some of these styles. A simple but effective sensor design for monitoring surface temperature is the ON-409 attachable su ace sensor. This design includes a thin, round metal stamping into which the thermistor is epoxied. The metal stamping can then be attached to a surface using an epoxy or other method to measure surface temperature.